Matrix service engineers were required to pass a series of rigorous tests and meet several criteria in order to achieve this status. 06/02/16, 05:08 AM | Factory Automation | Piab Inc.
A total of 100 decision-makers were surveyed who are responsible for the use of automation technology in their companies. THIS IS A COLLABORATIVE ROBOTS AND AUTOMATED MANUFACTURING CONFERENCE YOU CANNOT AFFORD TO MISS. 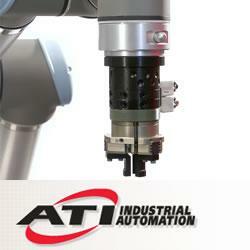 The automotive manufacturing industry is no stranger to automation and robotics. However, what the industry is now witnessing is an influx of next-generation collaborative robotics and automation technologies - technologies that are going to be provided at a lower cost than what the industry is used to, whilst driving safer, faster and more profitable manufacturing and maintaining a solid life-cycle. 06/01/16, 01:16 PM | Industrial Robotics, Factory Automation | machine vision | BitFlow, INC.
Machine makers in high-density I/O vision applications are challenged daily to find cost-effective, reliable ways to continuously control dozens of devices such as strobes, solenoids, and actuators, as well as to acquire data input from equipment ranging from photo detectors to triggers. Until now, the answer has been to purchase an I/O card yet this step requires additional costs, software, system complexity, and the use of a PC slot. Rising Media and 3DR Holdings announced more than 80 sponsors and exhibitors for the co-located Inside 3D Printing, RoboUniverse, and Virtual Reality Summit conference and trade show in Seoul, South Korea, taking place in association with the Korea International Exhibition Center (KINTEX). 05/31/16, 07:45 PM | Industrial Robotics, Mobile & Service Robots | RobotShop inc.
RobotShop Inc. announces today the launch of its subsidiary, RobotShop Japan Co., Ltd. and a website dedicated to the Japan market. 05/31/16, 11:21 AM | Factory Automation, Unmanned & Other Topics | Integro Technologies Corp.
Integro Technologies Corp., a leading vision integrator in Salisbury, North Carolina, has been named a Certified Integration Partner for MVTec. Valmie debuted AeroLift eXpress last month at the Offshore Technology Conference (OTC) in Houston. World Patent Marketing Invention Reveals The Latest In Drone Technology, The 4G Drone Link! World Patent Marketing Reviews A New Tech Invention. Will 4G Drone Link Be the Next World Patent Marketing Low Cost Success Story? Unmanned Life autonomous drones, in conjunction with technology from their partners, rapidly and correctly perform the sorting at a higher throughput and lower cost per sorted unit than the current industry standard.